TD and I were in Guilford, Connecticut, this weekend visiting my parents. On Saturday we went to check out the Guilford Antiques Show. It was held in the Elizabeth Adams School on Church Street and it was funny to be in again an elementary school which reminded me of my Clinton Road School in New Hartford, New York. We bought our tickets and proceeded into a smallish gallery filled with dealers. I liked the Majorca set, pictured above, fashioned to look like shucked cobs of corn. You already know that I love vases and plates that feature vegetables or fruit – like cabbage or radicchio or blue berries. This tall metal metal weather vane was mounted on a green wooden pedestal. Brown rust washed across its billowing sails. Wouldn't it be great to own this if you lived in a loft by the river. This kind of wooden sconce would be easy to make (if I was handy). I'd put a candlestick on it and a small flower vase or a sea shell. Out into the hall we went where more vendors were displayed. When you're little you think schools are big but actually the halls were narrow and the ceiling was low. A display case showed paper fish, made by children, dancing on gold paper waves. We got to the end of the hall and I was afraid that was the end of the show but we rounded a corner to this: the school gymnasium, filled with dealers. The wooden bleachers were folded up against the walls and reminded me of attending high school basketball games on frigid cold nights in New Hartford. We liked this pale wooden bench which we would use as a coffee table but it was too big for the apartment. The dealers, Steve and Lorraine German of Mad River Antiques in North Granby, Connecticut, said its square nails revealed that it was from around 1840. The top is one 18 inch wide plank which is unusual because trees are not that big anymore. The wood had grown in around the square nail heads. So interesting. Very "Swedish beach house" but just too big. Out in the hall, primroses were for sale. The woman arranging the flowers said, "A view of spring." There were lots of antique chests at the show which reminded me of a chest I own. It was my great grandfather's tool chest on the railroad. Dan O'Donnell came from Sligo, Ireland, and raised his family in Herkimer, New York. 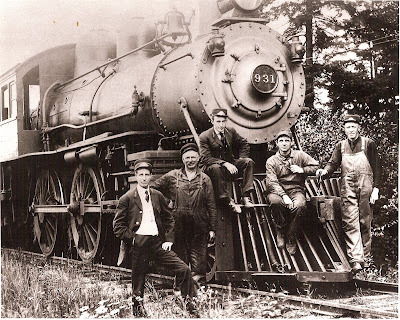 Here he is now, second from the left, engineer on the train from Herkimer to the Adirondacks. Here is his tool chest, in our living room. Painted and chipped with a heavy metal latch, it is one of my prized possessions. Years ago, my grandmother really insisted that I take the chest, and it languished for a while at my parents' house. Now I'm so grateful that she gave it to me. 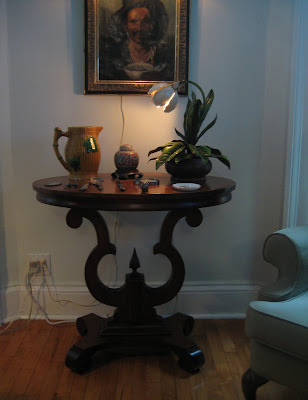 Near to that chest in the living room is a table which my great grandmother received on her wedding day. The dark wood sculptural scrolls and ornate base stand out against a pale wall. Its polished shape contrasts with the rough tool box. I love having these pieces from my great grandmother and great grandfather around me. They're gentle and evocative and create a comfort.